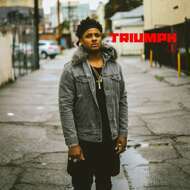 Grammy Award winning composer, producer, singer and drummer Ronald Bruner Jr. will present the megalithic debut album Triumph. Eleven cuts of deep fusion, soul, R&B, jazz and pop, Triumph was put together with Ronald’s brothers Stephen “Thundercat” Bruner and Jameel Bruner of The Internet. It was captured during the infamous KSL Sessions that produced Kamasi Washington’s The Epic and many other West Coast Get Down recordings. Lyrically, Triumph touches on the deepest extensions of the heart, the restraints of human connection and the dynamic free for all of growing through this world. Every cadence and form of Ronald’s singing is pulled from the bottom of his heart because of this. Family, friendships, love, turmoil, happiness, social issues, politics, musical heritage and many other topics find a seat at the table on Triumph. A powerful combination of musicianship and lyricism that’s unlike anything else out right now.